I am kind of regretting of getting my FR935 updated. Any software version delivers a new issue. First was the problem with the scale and now all of sudden with the 8.0 Resting Heart Rate went from 50ish to nearly 70. And this after checking that the values registered by the watch were way lower than that. Garmin said they "improved RHR accuracy" with the 8.0 version but what I saw is that they screwed up. I do not know if the changed the algorithm, but at least in my case the values make no sense. I think my FR935 was better off without updates. Interesting observation - my RHR also seems to be haywire the last couple days. I'm see the opposite and in my case it's for the better. I'm a extremely light sleeper and I toss and turn all night long. Because of this Garmin would give me a RHR 5-6 bpm higher from what I believed it to actually be after manually checking as soon as I woke. The beta 7.93 & now 8.00 seem to be giving me what I suspect to be more accurate readings. Jumping nearly 20 bpm is a bit excessive. Is this a nightly thing or a one time occurrence? I'm not wearing the watch during the night so I was using the second method to calculate it (For users that do not wear their device overnight, RHR is determined as the lowest average reading over a one minute time period during the day). In order to be consistent what I do is start using the device just right after waking up when my HR was lower. This was actually consistent with the 7.6. With the 8.0 I observed that RHR reading takes like an hour to be displayed in the device so I do not know what kind of calculations is doing. What really bothers me is that Garmin support told me nothing's changed and still using the same algorithms but what I saw says different. The problem with this is the lack of consistence. Since I'm using the watch I observed at least three different patterns for RHR. This makes a $500 device useless as a fitness monitor. 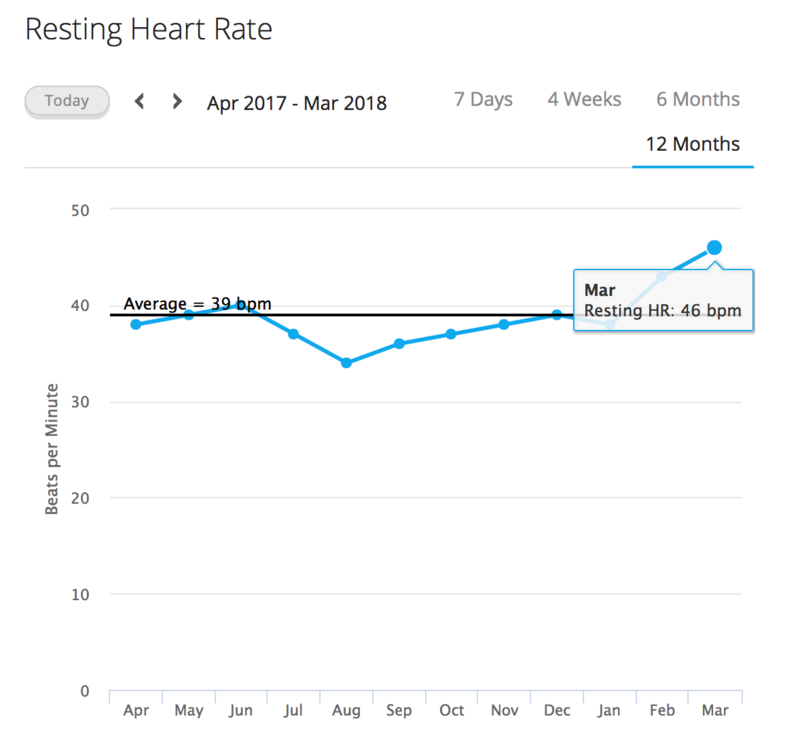 My RHR is increasing because I'm losing fitness? I'm getting sick? Or because Garmin engineer messed up with the software? I think I was better off with no tracking at all. Kind of missing my humble Polar M200. JoseR, it's basically the same for me. On the RHR graph I can actually see when 8.0 was installed. It also jumped up by 15-20 beats. I also don't wear the watch at night. The unfunny thing is that the last 4h graph even shows the more correct numbers. E.g. I can see that it was in the right area but probably not long enough to let the new algorithm take it as the RHR . I mean it showed me a 32 in the last 4h graph as plateau, the RHR graph shows me at 52-55 for that day. For many many years my RHR is in the range of 30-36. It's ok that it works better for others now. For my personal situation I consider the RHR as broken now. if you dont wear the watch at night, it will take the first reading as the RestingHeartRate... even if you get lower readings during the day. In my case, about every other day, RHR is not shown in the morning after wearing the watch all night, but is updated later in the day, usually late in the evening, just before midnight.It results in a sawtooth pattern graph: high RHR when deternined during sleep, very low when determined late in the evening. Not a problem (I'm using an alternate way of keeping track of RHR now), but it is curious. Since the 8.0 update my heart rate reading has been way off. As I type this just sitting on the couch my heart rate is reading 240. That would be normal if you're watching adult programming. Mine is definitely not working well. Started after the v7.x and continues through v8.0. I've tried everything short of a master/full reset. My 12-month trend graph is almost identical to yours. Well to be honest, that is exactly what you should attempt, a hard reset. If you raise this with Garmin it is there default position to cure any ill, and for the small amount of effort ot is well worth trying. Well, rebuilding your stats after a master reset isn't 'a small amount of effort' in my opinion. If there was an (easy) way to back up your stats on the watch I woudn't mind trying a master reset every now and then... But before your VO2max and I don't know what more is up to date again your quite a while further.